Every once in awhile, someone will ask me for advice on how to start reading literature in Japanese. …Okay, I’m just kidding. No one has ever asked me that. But I wish someone would, because then I could tell them about how Murakami Haruki is one of the easiest Japanese writers to read in the original Japanese language. His critics have said of him that reading his writing is like reading American English translated into Japanese. I think that’s supposed to be a bad thing; but, if you’re a reader of American English without a lot of experience reading Japanese, that sort of “translated” style is a godsend. Murakami’s sentences are relatively short and don’t have an unmanageable number of clauses, his paragraphs begin and end in reasonable places, the reader can easily differentiate between subject and object, his usage of idiom is generally familiar to someone who speaks English, and – best of all – he doesn’t use all sorts of crazy, high-level kanji. This is not to say that Murakami’s style or stories are childish and simplistic. Rather, Murakami has a unique style, and that style is very accessible to people used to reading American English. Murakami’s system of allusive references should also be familiar to anyone who has grown up outside of Japan and has a passing familiarity with cultural figures from John Lennon to John Irving. I don’t mean to suggest that Murakami’s writing is some sort of hodgepodge amalgamation of Western culture, though, as his imagery and analogies and narrative structures are definitely his own. Another nice thing about Murakami Haruki is that he has written a ton of short stories. These short stories have been collected into small, inexpensive books like Barn Burning and The Second Bakery Attack, but single stories are occasionally published individually in larger hardcover editions. 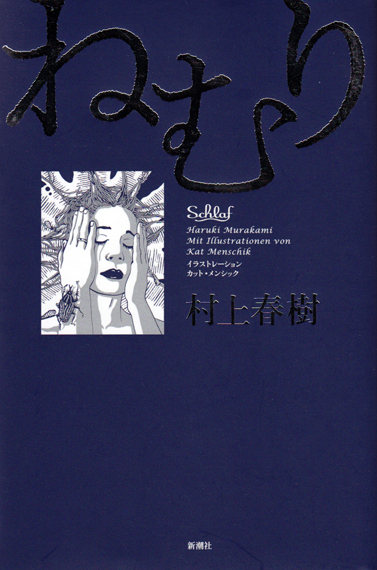 “Nemuri” (translated as “Sleep” in The Elephant Vanishes) is one of those stories. It was originally published in 1989 in the collection TV People; but, when the German publisher DuMont issued an edition of the story with illustrations by Kat Menschik, Murakami edited and updated the story so that a similar art book quality edition could be published in Japan. Such an edition was published, obviously, and it’s gorgeous. The story itself is interesting as well. The female first-person narrator once experienced a bout of insomnia in college, but she got over it and went on to marry a dentist and become a housewife. After having a kid and living with her family for several years, the protagonist’s life has fallen into a pattern of comfortable routine. One night, however, she experiences a terrifying case of sleep paralysis and wakes up to find that she is no longer has any physical urge to sleep. She tries to go back to bed, but she is simply not tired. She therefore pours herself a glass of brandy and begins reading Anna Karenina. The next night, she’s still not tired, so she continues not to sleep while staying up all night reading. Two nights turn into two weeks, and the narrator’s thoughts range from her daily life to the value of literature to how sleep works to the nature of life itself. Eventually, her musings on life turn into musings on death, and the narrative tension mounts until the story reaches and strange and disturbing conclusion. Despite its unaffected language and seemingly flat surface, Nemuri possesses a very literary flavor and rewards slow and careful reading. Kat Menschik’s surreal and striking illustrations, which are loosely based on the text, offer another layer of possible meaning and interpretation. If you’re looking for a good place to start reading Japanese literature, then, I would venture that Nemuri is as good of a place to start as any. The Japanese characters are clear and sharp and large enough to read easily, the textual layout isn’t too dense on the page, and there are enough chapter breaks and illustrations so that even the slowest reader will feel as if she is making good progress through the book. The meta-textual elements implicit in the discussions of Anna Karenina are oddly motivating for the reader as a reader, and the story itself is fantastic and compelling. The whole package is just about perfect. Even if you’ve already read the story in TV People, it’s still worth picking up a copy of Nemuri if you see it on your next trip to a Japanese bookstore. Murakami is a real master. I’ve unfortunately only read his works in their translated form, though. (I don’t know Japanese.) I’ve always wondered what it must be like to read in its original form, without the mediation of a translator — it’s odd, as I don’t often like reading translated works, but Murakami’s style is either highly compatible with the English language or his translators are excellent. (Maybe a combination of the two?) The way Murakami is able to balance so easily between accessibility and depth is quite special.